In many 1.d4 openings, Black has trouble getting his bishop on c8 into play. Former Russian Chess Champion Alexey Bezgodov presents a radical solution to this nagging problem: liberate your bishop right away and put it on f5 on the second move! Playing 2…Bf5! against either 2.c4 or 2.Nf3 will surprise your opponent and is also a great way to support your development, because the bishop takes control of the important square e4. If White does not immediately take decisive action, then within a move or two he can relinquish any hopes on an opening advantage. Alexey Bezgodov has studied and played this chess opening system for a long time. He has found some great antidotes to White’s most dangerous reactions in sharp and attractive lines. To test your understanding of his system he has included more than 100 exercises. After studying the fresh ideas and the clear explanations presented in The Liberated Bishop Defence every chess player will enjoy the flexibility of a surprising, effective and universal weapon against 1.d4. Alexey Bezgodov (1969) is a Russian Grandmaster and writer. He was Russian Champion in 1993 and came shared first in the 1999 Ukrainian Championship. He is the author of 'The Extreme Caro-Kann' (2014), another highly original chess opening book. "This is the first detailed work devoted to this complete answer to 1.d4 and Russian Grandmaster Bezgodov uses 100 deeply annotated model games to explain the opening and 103 exercises to test what the readers has learned." "Here is your opportunity to score with a novelty! 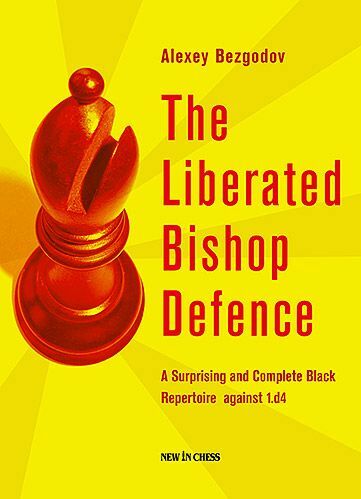 (..) I find 'The Liberated Bishop Defence' an excellent opening book. I would give it a 9.9 (out of 10). Why not 10? Well, the diagram on page 195 isn't correct." "Truly enriches the world of openings. The reader gets a well-constructed repertoire for Black, which is being presented in a way that is easy to understand." "Bezgodov analyses in detail many neighboring variations, so this book is also useful as a reference work (..) I think that this book could be of great help for many readers (with a rating above 1600)." "The trend to include exercises has been taken to another level. There are more than 100 of them therein for those who enjoy testing themselves. So there are lots of goodies for the money. I liked the writing style and found the book to be a great deal of fun. The personal touch of the author is everywhere, and the homespun novelties and analyses are stimulating." .....is there a pgn file?